Pharma Marketing Blog: Do Privacy Concerns Stand in the Way of Measuring Pharma eMarketing ROI? Do Privacy Concerns Stand in the Way of Measuring Pharma eMarketing ROI? 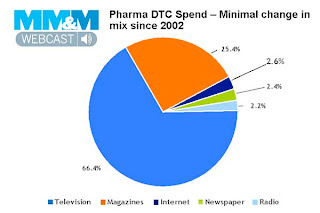 During yesterday's MM&M Webcast "How to get the right DTC mix - and measure the ROI," there was a lot of talk about why and how pharmaceutical companies should be spending more on Internet advertising. Of course, a few or all of the speakers have a vested interest in raising pharma's eMarketing bar. But a few good points were made and I was able to get an answer to my question of why pharmaceutical marketers don't measure eMarketing ROI (return on investment) as rigorously as do, say, packaged goods marketers like the Kellogg cereal company. Yes, privacy concerns were cited as one of the reasons. Before I get into that let me review a few points made by presenters. Dorothy Gemmell, SVP, pharmaceutical and medical device markets, WebMD, observed that "as more and more consumers depend on and go to the Internet as their primary source of health information, the pharmaceutical industry spending on DTC [direct-to-consumer] advertising has had minimal [my emphasis] shift since 2002. With 80% usage and higher satisfaction than any other media, the [pharma] spend is still at 2.6%". See chart on left (click it for an enlarged view). WebMD has reason for concern. It has twice this year lowered its estimate of ad revenue for 2008 (see "Pharma Online Ad Bellwether WebMD Foresees Ad Slowdown"). BTW, Gemmell did not mention the source of her data. When I analyzed measured media ad spending data from Nielsen Monitor-Plus, I found that pharma spends only 1.3% of its ad budget on the Internet (see "Pharma Recession, Part Deux: Online Ad Spending Sinking!"). Perhaps Gimmell's 2.6% figure includes online search, which can account for 40-50% of all online ad spending. Whatever! The real point is that the needle on pharma online ad spending has not changed since 2002 and perhaps even much earlier. 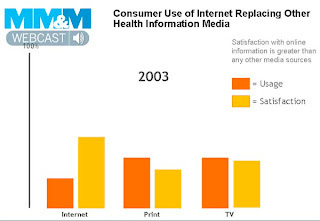 To support her claim that satisfaction with online information is greater than any other media source, Gemmell presented the chart on the left. Different people may interpret this chart in different ways. For example, when I look at this chart, I mentally multiply Usage x Satisfaction and see that print and TV may still beat the Internet using this combined Usage/Satisfaction metric. OK. That's the case for why the pharmaceutical industry should spend more online than it currently does. But why doesn't it? One reason often cited is the difficulty in measuring the ROI of online marketing (see, for example, "Why Pharmaceutical Marketers Ignore ROI" -- to get a $3.00 discount, use the Discount Code: BlogSpecial). Melissa Clark, director, integrated consumer marketing CV franchise, Novartis, who also spoke at the MM&M Webinar, provided some interesting details of why it is so hard for pharmaceutical companies to do eMarketing ROI. She mentioned difficulty in doing "match-back" studies and current limitations with online panels (more on that below). One of the presenters -- I'm not sure who -- showed that the packaged goods industry -- specifically Kellogg -- had no problem measuring their eMarketing ROI. 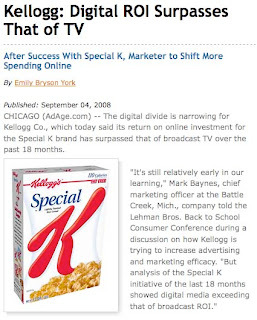 In fact, Kellogg recently announced that "its return on online investment for the Special K brand has surpassed that of broadcast TV over the past 18 months." And by a factor of "well over two," said Kellogg Chief Marketing Officer Mark Baynes, who plans to slash the company's TV-commercial filming by 10% to 20% in the next year (AdvertisingAge). "How did Kellogg get around the ROI obstacles that Clark mentioned and why can't pharma do it as well?" The answers given to that question were very informative -- and a lot more useful than all the talk about how great the Internet is for reaching and getting your message to consumers online. First, Gemmell speculated how Kellogg measured the effectiveness of broadcast advertising vs. Internet advertising. "My understanding is the measurement [of Internet ROI] was similar to the way they measure their broadcast [ROI], which was around purchase intent and lifts in awareness. Today, it is very hard to go all the way back to the Rx [prescription] for reasons that Melissa mentioned. The panels and methodology are new and very small." I've spoken to many experts that claim to have solved this problem for the pharmaceutical industry. ComScore, for example, uses panelist behavioral and survey data from current and prospective patients to provide pharmaceutical marketers with a better understanding of which e-marketing initiatives -- whether online banner ads, search marketing or branded and unbranded websites -- have the biggest impact on brand awareness, brand favorability, incremental new patient starts and incremental current patient adherence/next fill. You can hear all about this in the Pharma Marketing Talk podcast "Pharma eMarketing Benchmarks: Helping Pharma eMarketing 'Grow up,' Optimize & Scale." But Melissa Clark, who "worked quite a while at Nabisco," really hit the nail on the head in her reply to my question. First, she explained why the PG industry has a much easier task measuring eMarketing effectiveness. "It is much easier to measure what you're doing in the packaged goods world," said Clark. "you don't have to think about how to translate [what happens in] the physician's office into specific scripts all the way down to the patient level. The challenges that we're having as it relates to ROI is making sure that we do match-back studies...get patients to opt-in to market research and then take their data and send it through Verispan or Crossix who then match that data back to prescribing data." Clark referred to a "whole wealth of [prescription] data" that exists out there that pharmaceutical companies have access to through these third parties. Crossix Solutions, for example, claims to deliver "actionable, timely, authentic Rx and healthcare data to help pharmaceutical marketing teams and healthcare communications companies measure and optimize the impact of their patient adherence and consumer marketing programs." Sounds good so far. So why can't pharma do match-back studies? You have patients who have opted-in to marketing research and you have access -- through 3rd parties -- to their prescription data. QED as they say. Not so QED says Clark. "It's more difficult for us," said Clark, "because online most of the time we're collecting just e-mail addresses and not all of the data needed to do the match-back. We also have to make sure from a patient privacy perspective that people understand we would like to use their data for market research purposes and that they clearly opt-in and allow us to do that. The sheer amount of people you need to do a match-back study is a challenge because the online panels are not as large as the offline panels." I'm not sure if it's a matter of getting the number of study subjects or getting the opt-in to use personal data or both that is the real challenge. I assume if you can get opt-in in offline panels, you should be able to do it with online panels. Also, once you have the opt-in, why can't you get all the personal data you need to do the match-back? Matt McNally, SVP, media services, Digitas Health, mentioned how they measure channel effectiveness using coupons and BRCs that are uniquely coded to identify the channel source. "We do that also through our direct response vehicles," said Clark. The real challenge, said Clark, "is when we are trying to do awareness generating or drive to doctor tactics. It's those types of programs we have to find new ways to measure." Seems like we're close, but still no cigar when it comes to pharma eMarketing ROI measurement! Mack -- you ate your Wheaties (covered with Ritalin sugar) before you made this post. Great article. I just wrote a post on "Social Media For Health Care Professionals" and would love to know your opinion on it.